Project obstacles and solutions: Indian Creek is a protected watershed in southern Indiana. Two branches of the creek meander through Corydon, Indiana and merge in the downtown area before they feed into the Ohio River just south of the town. The two tributaries are locally designated as the Big Indian Creek and Little Indian Creek. For the past decade, there has been a concerted effort to clean up the watershed area. Since the area is in a karst system full of caves and sinkholes, contaminated water can quickly flow to those areas and pollute those ecosystems as well as spread bacteria to drinking water sources. 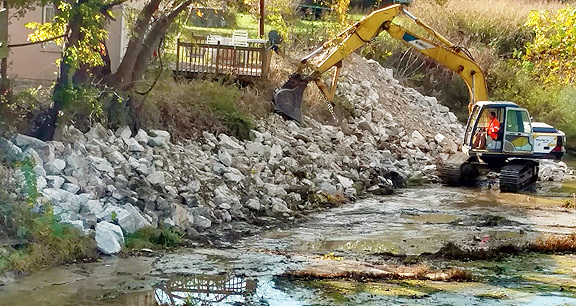 To those ends, the Town of Corydon was looking for a way to control erosion along the banks of the Big Indian Creek. Parts of the bank had been worn away and were encroaching on housing in the area. The town contracted with Ronnie Rosenbarger of Rosenbarger Excavating to add stone to the banks of vulnerable areas along the creek. IMI Aggregates in Corydon supplied Rosenbarger with 382 tons of shot rock and rip rap limestone. Because of its angular shape, crushed limestone provides an excellent soil erosion barrier. For more information on erosion control solutions, contact the sales representative for the IMI Aggregates quarry nearest your location. Click here.